Make your event something to sing about! 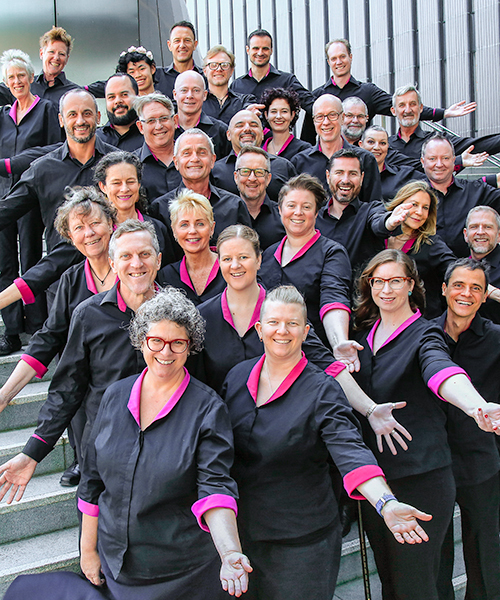 For over 25 years, Sydney Gay & Lesbian Choir has been breaking into song and breaking down barriers with its uplifting and inclusive approach to choral music. As one of Australia’s most popular community choirs with anything from 60 to 100 active singing members, it welcomes singers without audition and regardless of their sexuality, gender identity or musical experience. Sydney Gay & Lesbian Choir strives for musical excellence and undertakes a wide range of repertoire which has delighted thousands of people over the years. Sydney Gay & Lesbian Choir is able to add a special live entertainment component to your event, whether it be a gala dinner, corporate function, private party, exhibition opening, workplace conference, Christmas concert, community celebration, renewal of vows, anniversary, or wedding. There is nothing quite like the rich sound of voices singing in harmony. Sydney Gay & Lesbian Choir provide flexible options which can accommodate your venue size. We can provide group sizes from 16 singers up to our full choir which can be anything from 30-60 voices. Contact us now and request our Choir for Hire brochure for more information and our current rates.